Last Saturday was my first time doing a psychic home party with the great Nancy Bradley, the Celebrities Psychic. We have a new TV show called “Ghost Girls” where the two of us investigate mansions, hotels and lots of other spooky places. We also do psychic home parties where Nancy will give the guests a psychic reading while I teach them the basics of ghost hunting. I had a super time, and the guests really seemed to enjoy it. The part that really sticks in my mind was the past life regression reading. 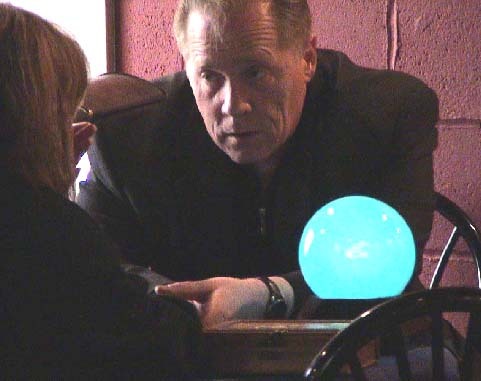 I’ve been under hypnosis many times, as my grandfather, John Hill, is a hypnotist. He helped me stop eating gummy bears everyday by telling me that they tasted like coffee grinds. Ugh! Coffee grinds are not a good taste; I don’t recommend them unless you mix them with water, chocolate and milk and call it a mocha. Back to the past life regression, I was sitting in the circle with all 22 party guests and decided that since I had never tried being regressed, that I would go for it. I sat and closed my eyes as Nancy rhythmically spoke to us and put us in a light state of hypnosis. I could hear everyone around me, I knew where I was, but I felt myself growing heavy and sleepy. It was a nice calm feeling and I felt the stress of the day melt away into nothingness. As I sat listening to Nancy, she said “Imagine yourself on a dock surrounded by water. The water is only 2 feet deep. There is a canoe waiting for you beside the dock… As I climbed into the canoe, which was more like a kayak for me, I felt like I could row the heck out of that thing and get somewhere really cool. But to my surprise, Nancy told me that the canoe-kayak would row it’s self and all I had to do was relax. Ahhh… That’s nice. I opened the door to a brightly lit room. Vast arched ceilings of white with intricate carvings surrounded me. She also told us to look for an item in the room. I found a lot more than one item; I found a whole table full of delicious treats. Iced cakes, petit fours, fruit platters and every dessert had a Maraschino cherry on top. I thought the cherry part was kind of strange since I can’t stand Maraschino cherries. But the dessert table was not far off, since I have an affinity for junk food. Nancy also told us to look for something shiny in the room. I found a beautiful, large, silver decanter and gazed into it to see what I looked like. I had a white powdered face, red lips brown curly hair peeking out from my white powdered wig. I was pretty. I turned around and began to spin around on the wooden cross-hatched floor. I remembered I was wearing a white silk, floral pattered dress with a hoop underneath. As I spun around I noticed a man wearing pale yellow silk sitting in a large chair. He had his leg strung over the arm of the chair and was bouncing it up and down. I remembered he looked a little bit like a frilly boy, but he had something very comforting about him. I stood in front of him and asked him his name. “Louis” he said. “I am your brother”. Hum? My brother, Tim McCabe, works at Home Depot and would never be caught dead in pale yellow silk. But I regress… I stood there looking at Louis’ face and remembered that he resembled Lestat in Anne Rice’s “Interview with a Vampire”. I asked Louis what year is this? He said “1734”. Where am I? “France, Madam”. Maybe the reason I regressed into 1734 France, was because I am such a fan of Versailles time period? I am so intrigued by Marie Antoinette, the clothing, the lifestyle and all the other things that came along with being a privileged brat. In 1734 there was a princess named, Sophie Philippine Elizabeth Justine who was born to King Louis XV of France. Louis XV was the grandfather of Louis XVI, who later married Marie Antoinette before the fall of Versailles. Fun. And I am sure you know how Marie Antoinette died, a nice beheading to end her day. As the night came to a close, I kept thinking of who I might have been. What was my purpose? Was I a painted lady who just ate sweets all day? Was I a courtesan? Who was I? Maybe on my next round with past life regression I will get more answers? Maybe it was just my wild imagination getting away with me? Either way, it was a whole lot of fun and I really look forward to our next Ghost Girls party to delve a little deeper! If you are interested in booking a Ghost Girls party of your own, please visit www.GhostGirls.net for more info!